15° Partly cloudy. Showers increasing. FULL TIMEHawthorn have well and truly annihilated St Kilda at the MCG in a match where conditions would normally not allow it. The Hawks very happy with a 145 point win. GOAL HAWKSFrom the boundary throw in it is tapped towards goal. Gunston runs onto it and kicks the sealer! Well not really but it's his fourth goal. GOAL SAINTSMontagna with a one handed handball to Hayes who finds Steven. 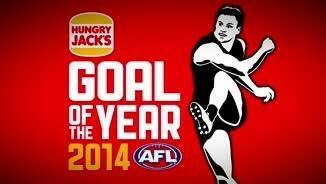 He runs in and kicks the goal. The Hawks fans are booing! They are a harsh bunch at Hawthorn! GOAL HAWKSA feel good moment at the MCG with the milestone man, Jordan Lewis, marking 35 metres out. In game number 200, Lewis kicks goal number 111. BEHIND HAWKSRioli goes with the outside of his boot, but he misses to the right. Surprisingly, the leading disposal gatherer on the field is not a Hawk. Leigh Montagna leads them all with 38 disposals. The sting has gone out of the game with just over three minutes remaining. Time for a useless fact. Hartung and Acres, both making their debuts today, are both wearing number 40. That doesn't happen all the time right? Hawthorn have been inside 50 63 times. St Kilda have been in there 23 times. That's a discrepancy of 40 and a pure annihilation in every sense of the word. 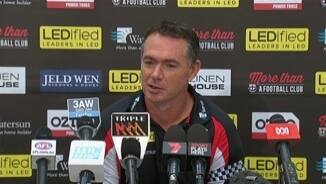 St Kilda have Carlton next week on the Monday night. They have to face a few awful truths about this performance before then. Hawthorn have been flawless in these wet conditions. It will be hard to single out three players for Brownlow Medal voting here. The umpires have a tough job ahead of them. BEHIND HAWKSGunston marks but he is unable to kick his fourth on this occasion. BEHIND SAINTSRiewoldt's shot at goal is off hands and through for a behind. GOAL HAWKSHodge kicks long to the top of the square. The ball comes out in the marking contest and Breust is there to rove and kick his fourth. Hawks by 139 points. 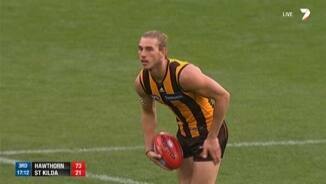 BEHIND HAWKSRoughead gathers with the agility of a small man but his kick for goal drifts wide. 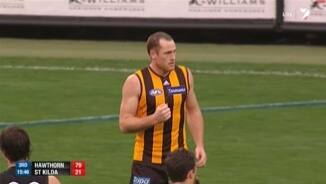 BEHIND HAWKSRoughead tries one from distance but he misses to the right. Some heavy rain falling could restrict the Hawks in their quest for the biggest winning margin at the MCG. GOAL HAWKSYours truly may have to call in the sub because we can't keep up! Hawthorn keep putting in goal after goal. This time it's Gunston who marks and slots it through. GOAL HAWKSThey continue to share it around with Breust running past and collecting the footy. He kicks it with the outside of his boot for his third goal. GOAL HAWKSAfter a slight break in transmission normal programming has resumed with Burgoyne gathering at ground level. He spins around and snaps it through for his second goal. 165 points is the biggest ever win at the MCG. The Hawks could give that a real shake. Saints InterchangeJames Gwilt off due to the blood rule. Hawks InterchangeBrian Lake and is possibly out for the game. Saints InterchangeJarryn Geary off due to an injury. Hawks InterchangeSam Mitchell off due to an injury. Welcome to MCG for the Hawthorn v St Kilda Round 7 clash. HAWTHORN has given St Kilda a painful reminder of how far it has to go to return to the top end of the ladder, mercilessly taking apart the rebuilding Saints in a record 145-point demolition at a rain-soaked MCG on Saturday. But the Hawks' 27.13 (175) to 4.6 (30) win looks to have come at a high cost, with star midfielder Sam Mitchell (right hamstring) and key defender Brian Lake (right calf) unable to complete the game. Mitchell was injured late in the first term, Lake early in the third quarter. After the game, Hawks coach Alastair Clarkson ruled Mitchell out of next Friday night's clash against the Sydney Swans at ANZ Stadium and said Lake was in doubt. The Hawks' winning margin was their biggest ever against St Kilda, eclipsing their 129-point win in round three, 1983. Hawthorn kicked the opening five goals of the match, but really flexed their muscles after the rain started at the quarter-time break, kicking 21 of the last 23 goals and holding St Kilda scoreless in the second quarter. The Saints entered their forward 50 just three times in that term to the Hawks' 19, with their first inside 50 not coming until the 25-minute mark. The Saints' half-time score of 2.3 (15) was their lowest against Hawthorn since round nine, 1960. 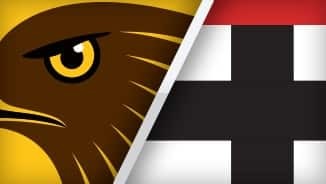 St Kilda youngster Jack Billings kicked the opening goal of the second half at the two-minute mark of the third term, but the Hawks then piled on 15 unanswered goals, 10 in the third quarter and five in the last. Jack Steven broke the Saints' scoring drought with a consolation goal with a minute remaining in the match. Clarkson said after the game that his team had an even spread of contributors against the Saints. "We shared the ball across all areas of the ground, particularly up forward, where we kicked 27 goals but our highest goalscorer [kicked] four," he said. 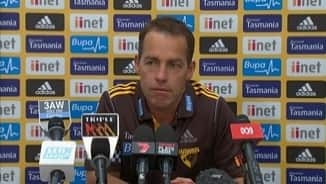 "It indicates that the players are well prepared just to give the ball to someone who was in the best position for Hawthorn to be able to score." Jarryd Roughead was outstanding for the Hawks on a tough day for key forwards, kicking four goals and dishing off two goal assists. 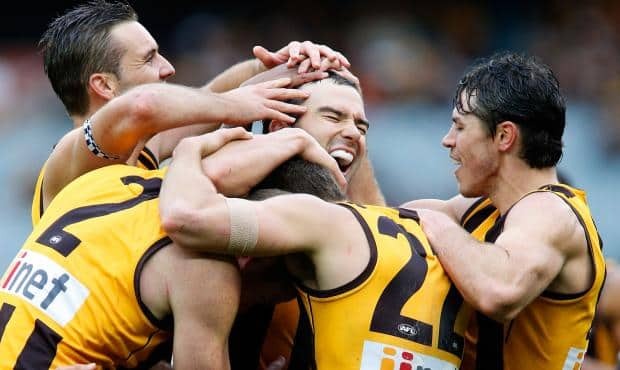 Shaun Burgoyne brightened a dreary day with his class through the midfield, racking up 33 possessions, while Josh Gibson was impassable in defence, Luke Hodge a ball magnet all over the ground and Luke Breust lively in attack with four goals. Ryan Schoenmakers also made an impressive return in his first game since rupturing an anterior cruciate ligament against Fremantle in round four last year, starting in attack and kicking four goals. 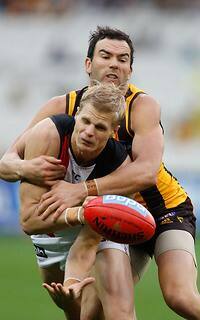 There were countless other strong contributors for Hawthorn, but St Kilda had precious few. Billings gave Saints fans hope for the future, showing flashes of his class in attack, while Lenny Hayes, Leigh Montagna and Jack Steven never stopped trying around the ground. St Kilda coach Alan Richardson said at his post-match press conference that the Saints had to learn from the pressure the Hawks had put them under. "We will review that performance really strongly, collectively and as individuals," he said. "We got an absolute belting today, there's no hiding from that and we'll learn from that. "To come up against the reigning premiers in that form and to play and fail dismally with respect to pressure – our ability not to apply it, our ability not to cope with it – that will be where our focus lies and we'll learn and grow from that performance." The Saints' day was soured even further by an elbow injury to defender Jarryn Geary in the second quarter that Richardson said would sideline him for up to 12 weeks. Hawthorn: Sam Mitchell (right hamstring) replaced by Billy Hartung at quarter time. St Kilda: Jarryn Geary (right elbow) replaced by Josh Saunders during the second quarter.